We left the Everglades behind for a few hours. We did not travel far. About 20 mins away is Marco Island. We had been there before but we were solely looking for Burrowing Owls so did not take too much notice of anything else and remember being not too impressed. But this time we did it properly. Lovely beaches with loads of people looking for shells - we now have a collection. You have to make sure they are not alive, which one was we picked up. 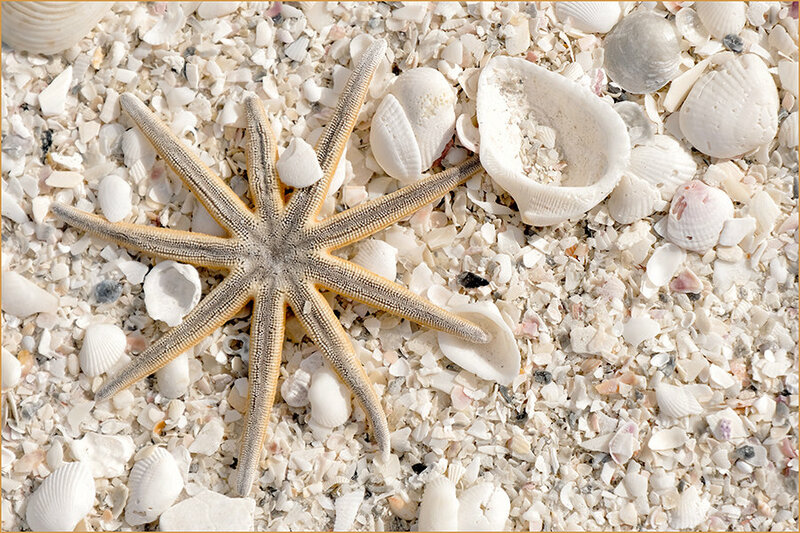 Lots of poor dead starfish left by the tide like the one in the pic. The only bad thing about Marco is that you cannot drive along the beach and there is very limited parking. All the hotels and condos etc are right on the beach. It would look much better if you had a nice promenade. I personally think they are trying to deter the day tourist. That is my view. Nice day though and lovely lunch at The Snook, which had been recommended to us by one of Jim's friends Geoff played golf with. Back at the hotel putting camera gear together ready to go and have a last go at the birds at dusk on the main road. Watch this space, although it is a bit cloudy and we may not get the light we had last time. The dusk birds were definitely not as good as a previous evening, going out that is. We drive 35 miles to Clyde Butcher's Gallery to see what we could find. However, on the way back - bingo. We found an ibis roost and the light was lovely. All along the way there are kingfishers on the telegraph wires and on various posts etc, but as soon as the car stops they are gone. We have tried taking them out of the car and have one, but it is not in focus - pesky birds. Lovely drive back with lots of birds and a lovely feeling of everything going home for the night. Beautiful sunset. Not a bad trip out and definitely worth the effort.